Address: 26 Iben Gvirol st. 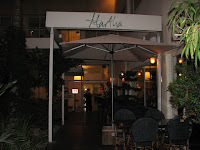 This restaurant is beautifully designed and has a clean and quiet atmosphere which makes it great to go out there. The menu has good meat dishes, like hamburger, kebabs, entrecote, chicken and also some seafood dishes like baked salmon, shrimps and fish fillet. The place also serves pastas but we won't recommend on those as they're not special at all. We took so far the spring chicken and hamburger, which are really good. 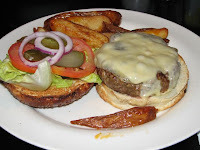 Yet, except for the burger, dishes are a bit smaller than other places we've been to. Besides main dishes they have a variety of appetizers, which we think are a bit expensive. We tried a vegetarian a ppetizer which contained roasted eggplant, lentils and tehina. It was quite OK.
Martha has a beautiful spacious terras in a garden outside which is great to sit in when it's not too hot. Martha is located on Iben Gvirol next to the London Ministore. You enter the place through a path in the restaurant's garden which is located at the white gate on the street (easy to miss but it's there).